Need a break from the tall buildings and masses of people in Philadelphia? There are plenty of camping spots less than two hours away from Center City. Here are the best places to go camping near Philadelphia, Pennsylvania. I chose these areas because they are all within an hour and fifteen minutes from Center City. If you’re in a different part of the city or in the suburbs of Philadelphia, you may find you’re even closer to some of these camping areas. You can go tent camping at all of these places and some of them also offer RV campsites as well as cabins for rent. Many of these camping spots are in New Jersey, so if you’re looking for places to camp near Philadelphia that are in Pennsylvania, you may also want to check out my post on the best places to camp in PA.
Parvin State Park is approximately 45 minutes away from Philadelphia. It is located in the southern region of New Jersey and has had a very interesting past. This state park was actually once a POW camp for German prisoners, a summer camp for displaced Japanese Americans, and the home of the Civilian Conservation Corps prior to WW2. These days, the park caters to nature lovers who want to camp in the woods, hike on the trails, and swim in the lake. There are 56 camping sites, bathrooms with showers and even laundry facilities. People can also rent one of 18 cabins which feature full bathrooms, which is rare for a state park. Hiking, Biking, and Horseback Riding – Parvin State Park has about 15 miles of hiking trails. Some of these trails are also open to people on horseback or on bikes. For a great view of the lake, you can take the Parvin Lake trail or the Thundergust Lake trail. Swimming – Parvin Lake offers a beach with lifeguards on duty. Boating – There are boat launches for larger boats but only electric motors are allowed. You can also launch sailboats, kayaks, and canoes into the lake as well. The lake is 95 acres so you’ll have plenty of water to explore. Fishing – Parvin Lake is designated as a place to catch trophy bass. You can also find carp, catfish, black crappie, chain pickerel, sunfish, and yellow perch. Hunting – Hunting is permitted in certain areas of the park during hunting season. Parvin State Park is the closest park on this list to Philadelphia and it offers many different outdoor activities. It has modern amenities and you can even rent cabins with full bathroom facilities at a reasonable price. Wharton State Forest is also about 45 minutes away from Philadelphia. According to the Department of Environmental Protection, it is the largest single tract of land within the New Jersey State Park System. There is a multitude of campsites to choose from and many of them are within walking distance to showers and potable water. You’ll find both tent camping sites and RV sites within the forest. Cabins are also available for rent as well. For a more rustic version of camping, you can reserve a spot in the Lower Forge or Mullica River areas. These areas can only be accessed on foot, bike, or horseback as motor vehicles are not allowed into the area. You can actually find campsites for as little as $5.00 a night near the river. On the other hand, you can rent cabins for as little as $65.00 a night and you’ll get a full bathroom, a porch, and even a refrigerator. Hiking, biking, and horseback riding. – Wharton State Forest has about 120 miles of hiking trails. These are spread out over 19 different trails. These trails go through pine forests, over and along streams, and through the historic Batso Village. Some trails are bike friendly and some are horse friendly. Here is a link to a trail map of all of the available trails. Historic Sites – This forest is home to historic mansions and even a small town. You’ll also be able to view the old canal as well. Boating – Canoes, kayaks, and boats with electric motors can all be used on the Mullica River. Ramps are available for a $20.00 daily fee. Swimming – Atsion Lake is available for swimming but there is a $10.00 – $20.00 fee depending on the day of the week. Lifeguards are available on site. Hunting – Hunting is allowed but restrictions apply. Wharton State Park has a lot of hiking and biking trails and you can go tent camping in the wilderness without having to venture too far into the woods. 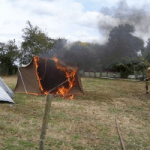 In addition to this, it offers up many opportunities for exploring history and shopping which might just be enough to persuade your less outdoorsy friends and family members into coming along on your camping trip. The Brendan T. Byrne State Forest is a pine forest that sprang up around the old Lebanon Glass Works. Ironically, the original forest was completely cut down to supply wood for the Glass Work’s furnace and only recovered after the wood ran out and the Glass Works had to shut down. Now the forest is home to campers, hikers, and even a historic village. Within the village, there is a blueberry and cranberry museum as well as a general store. There are 82 tent and trailer sites for camping as well as modern cabins and dry cabins. People renting dry cabins and some tent spots will have access to restrooms with showers. Hiking, biking, and horseback riding. – There are over 45 miles of hiking trails. You’ll be able to bike and ride horses on some of these trails. Here is a trail map of the T. Bryne State Forest. As you can see, the trails go by ponds and lakes and through the woods and even the historic village. This is another place that offers modern camping options as well as alternative activities to engage in. I love camping and hiking but it can get dull when the weekend ends up being rainy. Camping in a place that offers other activities to do is nice when the weather won’t cooperate. Want to stay in Pennsylvania? 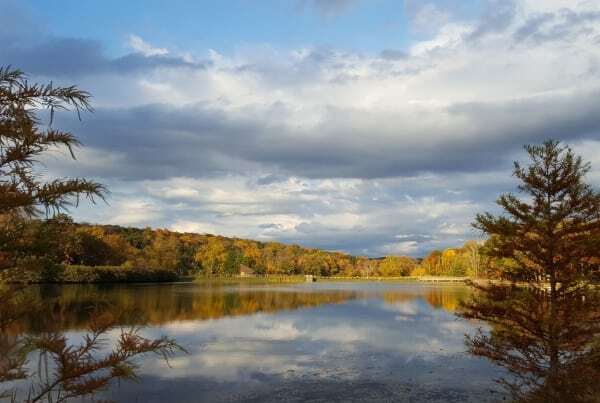 French Creek State Park is only about an hour and ten minutes away from the city center. It has 200 campsites as well as cottages and even yurts. There are restrooms with showers and RVers as well as pets are welcome to camp overnight. The park sits on 7,730 acres where campers can hike, bike, fish, boat, and swim. Hiking – There are 35 miles of trails spread out over 9 separate trails within French Creek State Park. If this isn’t enough for you, one of the trails connects with Valley Forge and the Appalachian Trail which is a full 130 miles. All trails within French Creek are considered difficult but you’ll be rewarded with nice views of lakes, mountains, and forests along the way. 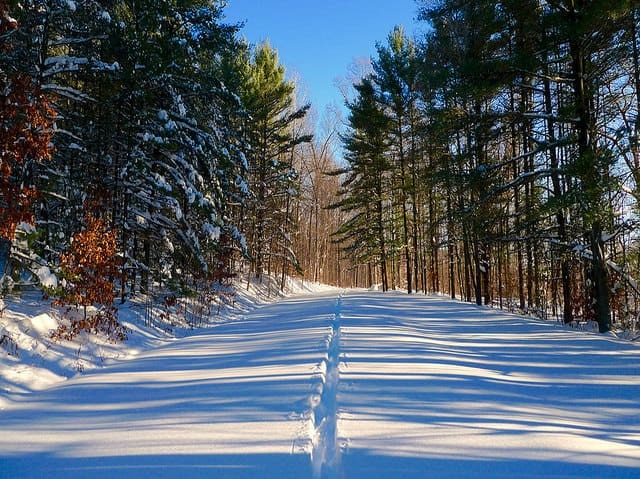 Horseback riding, biking, and cross country skiing can all be done within the trails as well. Swimming – There is a swimming pool by the lake and a lifeguard is on duty at the pool. Boating – While you can’t swim in either of the park’s lakes, you can boat. Both lakes have boat launches and between the two of them, you get 90 acres of water to boat on. Rental boats are available but feel free to bring your own boat as long as it does not have a gas-powered motor. Fishing – Scott’s Run Lake is stocked with trout three times a year so you’ll have 22 acres of trout fishing to enjoy. 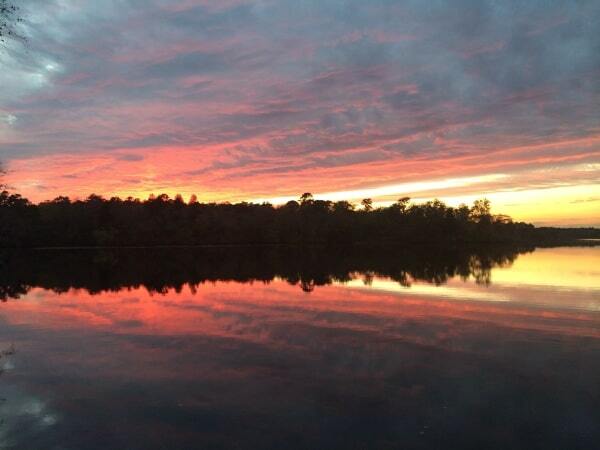 Hopewell Lake is a designated big bass lake but you’ll find chain pickerel, muskellunge, northern pike, panfish, and walleye in the lake as well. Hunting – 6,000 acres of the park are open to hunting deer, turkey, rabbit, pheasant, and squirrel. For starters, it is the closest Pennsylvania State Park to Philadelphia that offers camping. It is also a dream for advanced hikers as most of the trails are challenging to hike through. I’m disappointed that you can’t swim in the lakes but it is nice that you can still use them for boating and fishing. The fact that the lake is stocked with trout three times a year doesn’t hurt either. Belleplain State Park was the first state park I ever visited and thinking about it makes me nostalgic. This isn’t why Belleplain made the list though. Belleplain State Park is only about an hour and fifteen minutes away from Philadelphia. It resides within Belleplain State Forest which is over 21,000 acres large. This park has a lot to offer inside of it as well as outside of it as it is close to all of the southern beaches of New Jersey. The forest was literally worked on for over 80 years to make it a great place to swim, boat, fish, and hike. There are 169 camping spots for tent campers and RVers and they are one of the few parks in the area where you can tent camp in the winter. When camping there, you’ll also have access to showers and laundry facilities. Hiking – There are almost 50 miles of trails to hike on within the park. These trails are spread out over 23 different trails. Here is the trail map for Belleplain. Swimming – Lake Nummy is open to swimming from May to September and there are lifeguards on duty. Fishing – The lake is shallow but it has plenty of bass and pickerel. Canoeing and Kayaking – You can easily launch cartop boats in this lake as the waters are nice and still. Not a very exciting lake to kayak on but great for people looking for a day of leisure out on the water. When you’re camping at Belleplain, one minute you can be hiking, fishing, or kayaking, and the next minute you can be getting ready to go to the boardwalk. This campground offers vacationers a great compromise between camping and going to the Jersey shore. Green Lane Park is another Pennsylvania camping spot located right in Montgomery country. It is about an hour away from Philadelphia. This county park has two different campgrounds for tent campers to enjoy. One is the Deep Creek Campground and the other is the Equestrian Campground. There are 30 camping spots in the first campground and ten in the second. The Equestrian Campground is unique in that you can camp there with your horse. Personally, I don’t have a horse but if I did I think this would be the first place I’d go to find a campsite. Hiking – There are over 21 miles of hiking trails in Green Lane Park. These miles are spread out over 8 different trails ranging in difficulty levels. Some of these trails are open to bike riders and horseback riders. Many of the trails run next to the Green Lane Reservoir. Fishing – The Green Lane Reservoir, Deep Creek Lake, and Knight Lake are great places for fishing. You can cast your line in from the shore or you can head out onto the fishing pier. Within the water, you’ll find bass, channel catfish, carp, panfish, crappie, perch, and trout. Boating – All three lakes allow kayaks and canoes, and all but Knight Lake allow boats with electric motors. You don’t see too many counties offering up county parks with campsites built into them. Equine lovers are especially blessed as they get to spend the night camping with their horse as well. The fishing and boating opportunities are great and there are enough hiking trails to occupy most hikers for at least a few days. I added this campground for people looking for camping in a resort-like setting. There are tent camping sites here as well as large RV sites. Most of the tent camping sites are away from the RV sites and sit right next to the Brandywine River. There is a pool, a pet walk, a mini golf course, a playground, and a lodge on-site. You’ll also have access to wi-fi and cable and there is even a dog park. Shuttles go into the city as well as to nearby tourist attractions. You can fish right in the Brandywine river and canoes and kayaks can easily be launched from this campground as well. The campground is a nice respite for people living in the city but is especially useful for people visiting the city with their RV in tow. The KOA is less than an hour away from Philadelphia and is also convenient to historical and shopping areas. The Philadelphia area doesn’t have nearly as many camping opportunities as the other large cities in Pennsylvania but opportunities are there. Thinking a little outside of the box and traveling out of state sometimes adds to the number of camping spots and keeps you from having to drive more than an hour to go camping. Just keep in mind that these travel times do not include heavy traffic which we all know can easily triple the time it takes to get anywhere in Philadelphia.